1625 Shattuck Ave. in Berkeley, California. 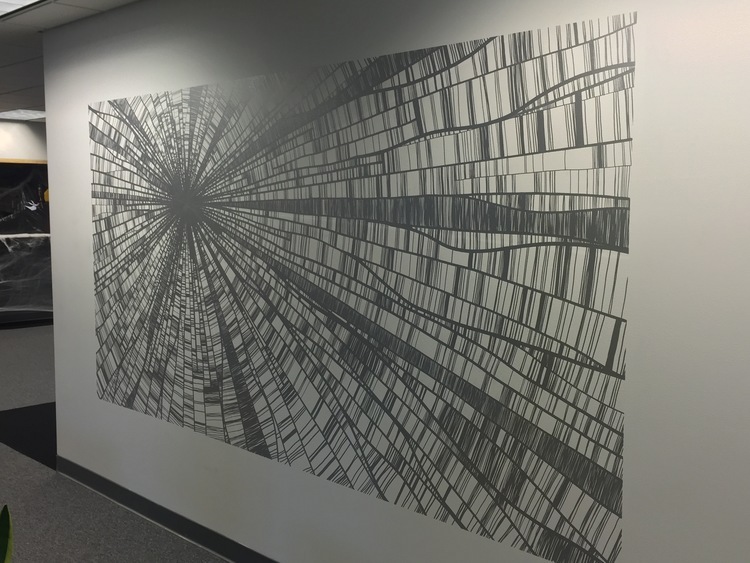 This piece was created over 7 days for Cohen Rojas Capital Partners in late 2017. The inspiration for this project was from an idea of limiting myself to a single shape, in this case is a rectangle, then use only that one shape to create a successful composition. I've found that with extreme limitations I am forced to test myself in difficult ways, this in turn shows me new aspects of my work and my mind which become an outer display of an inner experience. Bloc 15 is an event space near Jack London Square in Oakland. For this project I was commissioned to reimagine the outer walls in an unhindered and wild freeform style. The design directive was something along the lines of "go crazy with it" and this is the result. With this piece I felt it was important to harmonize with the surrounding graffiti styles present in the neighborhood but I also wanted to avoid the trap of stereotypically urban motifs. End to end this piece is the largest I've done and stretches the length of a block at a height of about 20 ft. To date this is my biggest piece and second time painting in the open air. During the year leading up to December 2016 I created an exhibition at MightyBox Industries reimagining the role of perspective points as a tool for understanding reality. It seems to me the entirety of our world emanates out of (or possibly into) a distant source point we will never meet. Beyond that event horizon something that our entire reality manifests out of. I wanted to address this phenomena by inventing new forms and structures which would point to that source point. 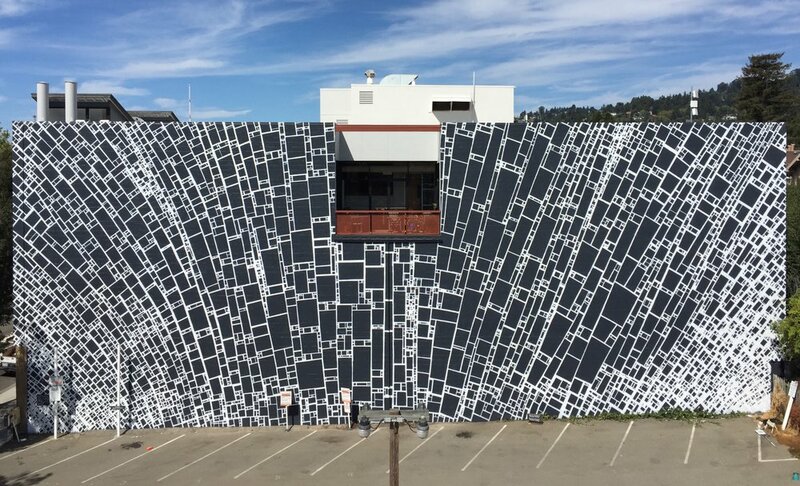 I executed the the work in a variety of mediums, formats, and styles which culminated in a 47' high mural on the front of the building which housed the exhibition. 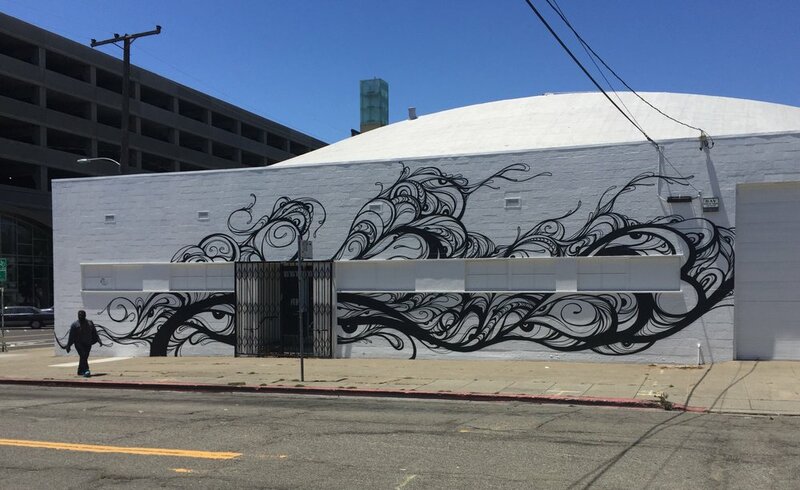 The MightyBox mural is clearly visible from Interstate 80 leading to the Bay Bridge and has become a significant archetectual icon in the Mission District area. Through experimenting with inversion (white on top of a black ground) I found that the lines gained new vibrancy and an intense visual interest became focused on the emanation point. In spring 2016 I travelled to Brooklyn for the inception of a guerilla art space known as Grey Market. During that time I created this 9 panel wall drawing, the Genesis Portal. The form ended up becoming a significant motif for me throughout the year. From this piece I became enthralled with the balance between chaos and order and the complexity that can come from a simple S shaped lined. This went on to become the inspiration for the exhibition at MightyBox, "Between Form and Void". In that show I explored the limits limits of perception by creating aesthetic structures that expand out from, or constrict into, a central point which I think of as The Source. Groundbreaking cuisine and an underground art space. This project was commissioned by Timothy Felkner who opened up the short lived Oro restaurant during summer 2015 in Mint Plaza. The main motivation here was to create a sweeping piece of art that encapsulated all sides of a subterranean hallway which leads diners to the restrooms in the basement of the building. During the design phase I was struck that the work space was underneath the streets and buildings of San Francisco. I felt the power of being INSIDE the city. I was reminded of the 1906 earthquake and the energy that lies dormant underground. I thought of the nutrients in the Earth which gives rise to the food that grows from it. This two ideas harmonized and became the swirling sprouting mural that emerged. When I began this project the area had a dull, bland industrial feel with no life to it. Afterward, I created a one of a kind art piece which was an interpretation of what it's like for life to emerge from deep inside the city. A small step toward addressing one of the biggest issues in SF. How do art + tech get along?